When night falls and danger emerges from the shadows of Hammer Town’s alleyways, “Defendor” is the only man who stands between us and the drug-ravaged streets. He is the last bastion of decency, the last honourable man: he is Defendor! But he is also Arthur Poppington (Woody Harrelson), a simple man who lives in the workshop of the construction company that employs him to hold traffic signs. Arthur is a self-made superhero who runs afoul of the law when he lays a beating on an undercover cop, Chuck Dooney (Elias Koteas), who was abusing a young prostitute named Kat (Kat Dennings). Always the hero, Arthur takes Kat to his secret hideout hoping she can help him find his arch-nemesis, the diabolical Captain Industry. Mistakenly convinced that Captain Industry killed his mother, Arthur has made it his mission to track down this enemy at all costs. But in order to do so, he must first overcome his most difficult challenge ever: convincing the court-appointed psychiatrist Dr. Park (Sandra Oh) that he’s sane enough to be on the streets. 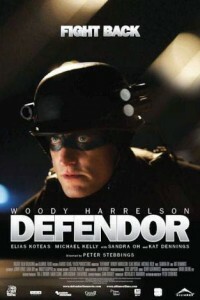 “Defendor” is the clever and original feature debut from writer and director Peter Stebbings. Using familiar comic-book tropes, he adds a gritty realism to the genre and subverts convention by evolving a character largely unaware of his true identity. Harrelson is superb as Arthur, a man trapped in his childhood who bases his entire worldview on the panel-to-panel philosophy espoused by the comics he pored over as a child. Woody Harrelson gives Arthur an innocent humanity and heroic spirit that belie his hockey-gear-meets-duct-tape costume. And Koteas is wonderfully wicked as the corrupt Dooney, the face of a city and society in collapse. Steeped in comic-book iconography but stripped of the elaborate trappings of modern movies of the genre, “Defendor” questions our comic-saturated culture. By adopting a central character whose only special powers are kindness and determination, the film repositions the meaning of “superhero.” Feeling very much a film of the new economic landscape, “Defendor” finds its hero in the midst of a very real, decaying city, suggesting that true courage lies in the least likely individuals and that it only takes only one ripple to make a wave.